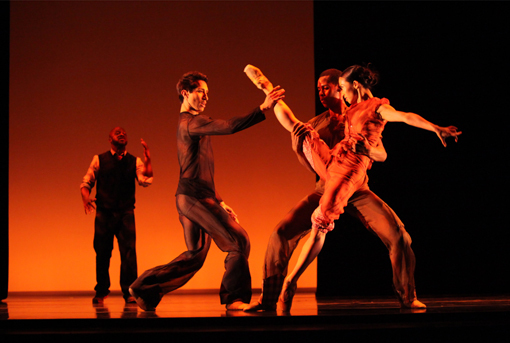 wanderlust ATLANTA: Atlanta Ballet's "20/20: Visionary" is Powerful! Atlanta Ballet is currently performing one of their magnificent trio programs. Through Sunday, 20/20: Visionary "features three distinct works, each created exclusively for Atlanta Ballet, promising a variety of movement, music and diverse themes." And it does exactly that! There's a 20-minute intermission between performances allowing an opportunity to "reset" one's senses for the next powerful performance. 20/20: Visionary is one of many planned tributes to Atlanta Ballet's Artistic Director John McFall. After 21 years with Atlanta Ballet, he will be retiring in June. Playground, a world premiere, is bought to us by British choreographer Douglas Lee, and it is my personal favorite of the trio of performances in 20/20: Visionary. "...Lee has developed a distinct choreographic voice, which is characterized by stunning sculptural images created by the use of exquisite and complex partnering and a masterful use of the classic vocabulary." Lee's Playground immediately engages a sense of happy nostalgia and takes you to a carefree time of joyously playing with other children. It also reminds us of some of the challenges that childhood playgrounds bought us...bullying and fighting. Then it magnificently reveals the beauty and reward of learning to play together, for the joy of it. It left me longing for simpler times and yearning for that contagious laughter that only children at play can give the world...it left me grateful for having revisited those experiences. Unfortunately, I'm not privy to any production photos of Playground, but please allow me to share with you that the lighting in this show is absolutely, without question, spectacular! Lighting Designer Les Dickert was in the audience last night, but I didn't get a chance to share with him how much I enjoyed his work. The lighting is perfectly balanced and enchanting, subtle and revealing. "Congratulations!" Les on such beautiful lighting! Boiling Point, choreographed by the acclaimed Darrell Grand Moultrie, "is a buoyant, fast-paced work that heats up the stage as dancers put their bodies to their limits, showcasing the searing, demanding athleticism of dance." This is the kind of performance that gifts the epiphany that this is a number that can ONLY be performed by dancers classically trained in the art of ballet. One of my favorite moves in this piece was when a ballerina danced across the stage and was leaping into the darkness of offstage when another dancer counteracted her forward motion quickly and elegantly then gracefully delivering her again to the stage. That single move, executed so beautifully, is the kind of precision mixed with elegance that keeps me returning to the ballet, again and again. Home in 7, first performed in Atlanta in 2010, is an Atlanta-inspired piece with spoken word by Marc Bamuthi Joseph (pictured above, left) and live music by the magnificent violinist Daniel Barnard Roumain. Choreographed by Amy Seiwert, who had never visited Atlanta, 12 Atlanta Ballet dancers beautifully performed this emotionally charged piece. The dancing is magnificent, the music is beautiful, and the poetry is remarkable. But, having read that the piece was to be "unique and reflective of Atlanta"—a city I love—I was hoping that it would speak more to our strengths, to our progress. It's quite sobering, instead, bringing to light parts of our past that aren't so pleasant, but at the same time should not be forgotten. 20/20: Visionary is a beautiful tribute to Artistic Director John McFall and we all wish him a fulfilling retirement come June of this year. I'm anxious to see what direction the new Artistic Director, Gennadi Nedvigin, brings to our world class Atlanta Ballet! This Atlanta Ballet show has only four performances over three days, only two performances remaining at the time of my publishing this...so get your tickets now and treat yourself to a wonderfully magnificent and powerful experience!